You then invite students and staff to write out their questions or answers (depending on what you’re asking!) on post-its and to stick them on to the paper. Chat with them about what they’ve written. You can run ”Bring on the Wall” stalls at loads of different times of the year. Stall: Ask permission to run a stall for a few days of a week, in reception (or somewhere popular with students). 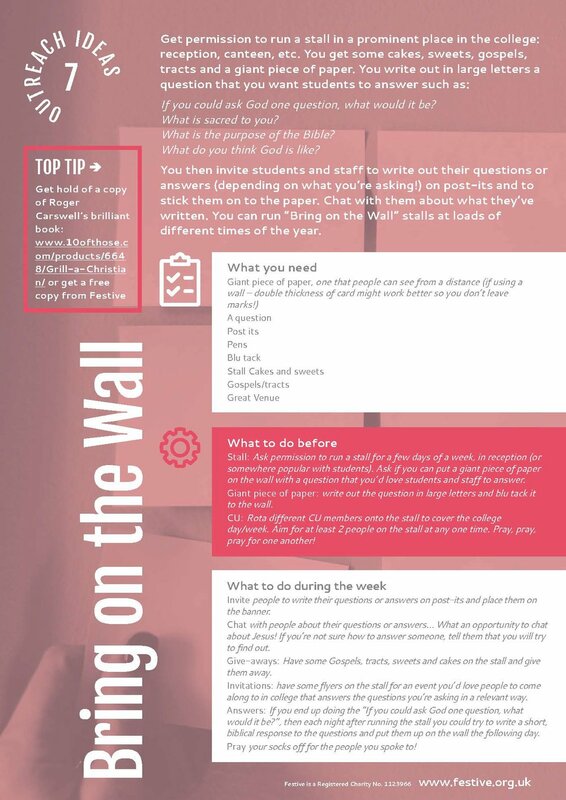 Ask if you can put a giant piece of paper on the wall with a question that you’d love students and staff to answer. Giant piece of paper: write out the question in large letters and blu tack it to the wall. CU: Rota different CU members onto the stall to cover the college day/week. Aim for at least 2 people on the stall at any one time. Pray, pray, pray for one another! Invite people to write their questions or answers on post-its and place them on the banner. Chat with people about their questions or answers… What an opportunity to chat about Jesus! If you’re not sure how to answer someone, tell them that you will try to find out. Give-aways: Have some Gospels, tracts, sweets and cakes on the stall and give them away. Invitations: have some flyers on the stall for an event you’d love people to come along to in college that answers the questions you’re asking in a relevant way. Answers: If you end up doing the “If you could ask God one question, what would it be?”, then each night after running the stall you could try to write a short, biblical response to the questions and put them up on the wall the following day. Pray your socks off for the people you spoke to!